Celebrate a weekend of delicious Latin food, authentic entertainment, exciting vendors and lots of caliente dancing at this year’s Woodbine Latinfest. Taking place October 1-2 at Woodbine Mall in Etobicoke, Woodbine Latinfest will feature the very best in Latin culture. Experience Latin American cultures with an all star cast of Latin bands and artists. 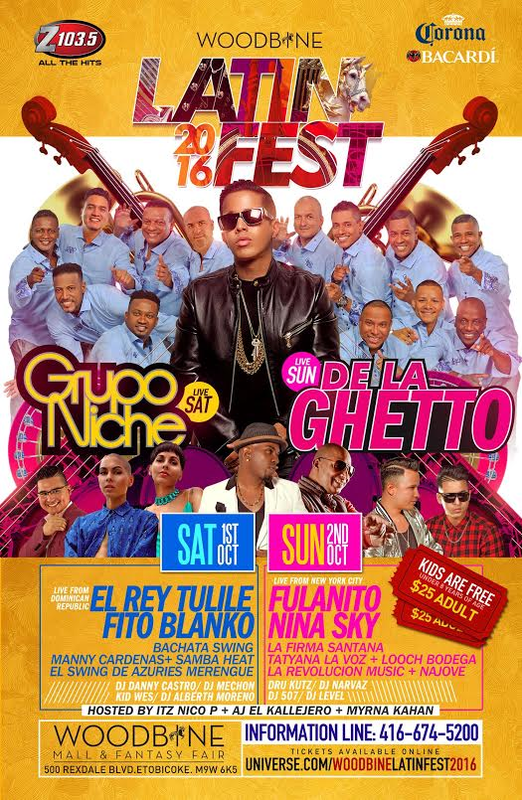 This fantastic lineup will include Grupo Niche from Colombia, El Rey Tulile from Dominican Republic, De la Guetto from Puerto Rico, Fulanito, and Nina Sky. With the Latin community in Toronto bigger than ever, Woodbine Latinfest will also feature various local artists. Some of the hottest performances will include Fito Blanko, DJ Danny Castro, Looch Bodega, Manny Cardenas, DJ Mechon, Tatyana D’Voce and many more. In addition to great food, drinks and live music, guests can practice their dance moves with Bachata Swing and dance alongside SAMBA Heat, two of Toronto’s hottest Latin acts that will keep family and friends dancing all weekend long. Indulge in a variety of unique Latin plates including Bandeja Paisas, Empanadas, Arepas, Pupusas, Tacos, and Tamales, among others. With various of exhibitors, so many talented vendors, ongoing entertainment and a full day of fun, the Fest will surely please all those who attend. Saturday, October 1, 2016 1-9 p.m.
Sunday, October 2, 2016 1-8 p.m.
For line-up details and more information on Woodbine Latinfest, please visit http://www.woodbinecentre.ca. Follow #woodbinelatinfest or ‘Like’ Woodbine Mall on Facebook. Woodbine Centre, located at Hwy. 27 and Rexdale Blvd. in Etobicoke, Ontario, offers over 160 stores and services under one roof including the Bay, Sears, Rainbow Cinemas and Zellers. Woodbine Centre is home to Fantasy Fair, Ontario’s largest Indoor Amusement Park, which has served over eight million guests since first opening in 1985. Located inside Woodbine Shopping Centre, Fantasy Fair has 12 full size rides and attractions and offers birthday parties, educational fun and group visits year-round (including stat holidays).